Did you miss J.S.Watts being interviewed by the awesome Kristi Petersen Schoonover on the last ever Scary Scribes broadcast? Would you like to listen to the first two chapters of A Darker Moon being read by Kristi? 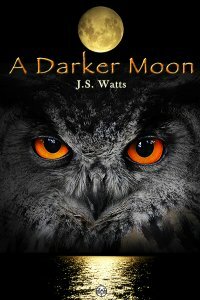 Do you want to hear J.S.Watts talking about A Darker Moon, her poetry and her writing in general? Do you want to get the inside scoop on J.S.Watts' next novel? If you answered yes to even just one of these questions, you should listen to this in depth interview with J.S.Watts on Scary Scribes. Songs of Steelyard Sue by J.S.Watts is one of the poetry chapbooks nominated for the 2013 Elgin Award. The Elgin Awards, named for Science Fiction Poetry Association founder Suzette Haden Elgin, are presented annually by the SFPA for books published in the preceding year. There are two categories, Chapbook and Book. Books are nominated by members of the SFPA, who may not nominate their own books, but may nominate multiple books, and the books need not be by members in order to be nominated or to win. J.S.Watts is not a member of the SFPA, but is delighted that Songs of Steelyard Sue is a candidate for this award. A list of nominated books is posted on the SFPA website. The nominations' deadline is May 1; the voting deadline is July 1. Winners will be announced on July 15 and the awards will be presented at WorldCon (LoneStarCon 3, San Antonio, TX, Aug. 29–Sept. 2, 2013), with the Rhysling awards. We have been reliably informed by those in the know that the poem "Steelyard Sue Builds a Baby", from J.S.Watts' poetry pamphlet "Songs of Steelyard Sue", has been longlisted for the Data Dump "Best SF Poem of the Year" Award. This is gratifying news and we are gratified by it. Thank you Data Dump.